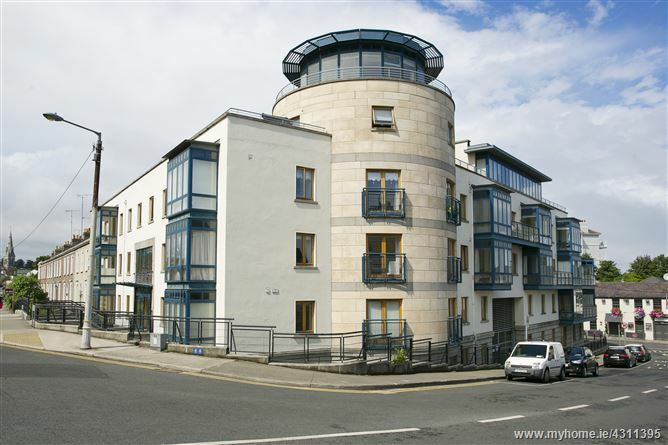 Hunters Estate Agent is delighted to present this superb second floor two bedroom apartment to market. Extending to a generous 63sq.m/679sq.ft. approx. This property offers flexible accommodation that will appeal to many downsizers, first time buyers and investors alike. The property has the great benefit of gated underground off-street car parking and has great potential for rental due to its location in Monkstown and super transport links. Internally the apartment is very well presented and full of natural light due to its dual aspect position. The open plan dining/living room provides excellent space to relax, off this lies a fully fitted kitchen with window to the front. There are two double bedrooms, the master with ensuite and a separate bathroom accessed via the hall. There is a balcony off the second bedroom overlooking the communal garden area. De Vesci House is located within walking distance of Monkstown and Dun Laoghaire, with a vast array of amenities, including Dun Laoghaire Shopping Centre and Bloomfield Shopping Centre. Nearby schools include CBC Monkstown, Newpark, Blackrock College, Rathdown, Castlepark, Sion Hill, The Harold and Monkstown Educate Together to name but a few. The city centre is easily accessible via the DART which is a walk away and via numerous bus routes including the 46A. One of the properties most attractive features is the close proximity to the coast, in particular Dun Laoghaire Harbour with its yacht clubs and piers. Laminate wood floor, intercom, storage closet. Main room, carpet, built-in wardrobe. Shower, w.c., wash-hand basin, fully tiled, heater, extractor. Bath with shower, wash-hand basin, w.c., fully tiled. Spacious, laminate wood floor, electric fire, recessed lighting. Fitted kitchen with integrated hob and oven, view to front, plumbed for washing machine and dishwasher, fridge freezer, tiled floor, splashback. Seating area, wall lights, beautifully landscaped with mature planting and raised flower beds. •	Extending to 63sq.m/679sq.ft approx. Travelling from Monkstown village on Monkstown Crescent in the direction of Dun Laoghaire, De Vesci House is located on the left after the turn for Longford Terrace. No information, statement, description, quantity or measurement contained in any sales particulars or given orally or contained in any webpage, brochure, catalogue, email, letter, report, docket or hand out issued by or on behalf of Hunters Estate Agents or the vendor in respect of the property shall constitute a representation or a condition or a warranty on behalf of Hunters Estate Agents or the vendor. Any information, statement, description, quantity or measurement so given or contained in any such sales particulars, webpage, brochure, catalogue, email, letter, report or hand out issued by or on behalf of Hunters Estate Agents or the vendor are for illustration purposes only and are not to be taken as matters of fact. Any mistake, omission, inaccuracy or mis-description given orally or contained in any sales particulars, webpage, brochure, catalogue, email, letter, report or hand out issued by or on behalf of Hunters Estate Agents or the vendor shall not give rise to any right of action, claim, entitlement or compensation against Hunters Estate Agents or the vendor. Intending purchasers must satisfy themselves by carrying out their own independent due diligence, inspections or otherwise as to the correctness of any and all of the information, statements, descriptions, quantity or measurements contained in any such sales particulars, webpage, brochure, catalogue, email, letter, report or hand out issued by or on behalf of Hunters Estate Agents or the vendor. The services, systems and appliances shown have not been tested and no warranty is made or given by Hunters Estate Agents or the vendor as to their operability or efficiency.